Today is a very special and very last-minute transport day. We learned about a bad situation in Tampa, FL, and are bringing seven cats down to South Florida to save them from a sad and horrible hoarding situation! Without going into too much details (because they're still coming out and I don't have them all), there was a woman who was supposedly involved with cat rescues in Tampa, who was taking in sick cats from kill shelters around Florida. She had about nine from our local shelters that we always save our kitties from. The woman went on vacation to New Mexico and had a stroke while she was there, ended up in the hospital and it was not certain she'd be coming back to her house at all. And so, because of this, it became known that she had way too many cats. Way too many, and they weren't all in great shape. I have heard many stories, and I am sure none of them are even the whole story. I have heard of filth and dirt and overcrowding and cats that were starving and cats that were sick. One cat, I'm told, had an eyeball basically hanging out. Perhaps the most saddening is that we learned that she had regular cats, FIV cats and FeLV cats all mixed together when they were supposed to be separated. Senior Pretty at Pompano before ending up at the woman's house in Tampa. At first the estimates were that she had about 40 cats. Word got out and rescues scrambled to re-rescue cats they had sent to her and also to find homes, fosters or adopters for the ones that weren't spoken for. The first day, the amazing woman who helped orchestrate the rescue and was the one who was actually going in the house and getting the cats out took 20 of the sickest cats out the first day and went straight to the vet with them. They were all tested and checked out. The next day she returned and took out 24 more. At this point it was clear there was more cats than we thought. Estimates went up to 60. The next day she went in again and pulled more. The same with the next day. At this point, she had taken 74 cats out of the three-bedroom home... and she estimated there were probably 10 more in there who were scared and hiding in couches or in beds and not allowing her to catch them. She borrowed humane traps and set them in the house -- trapping cats in a home! Last count: There were 85 cats total. I believe about 15 ended up testing positive for FIV or FeLV. We don't know how many had it when they got there -- there was no paperwork to be found. Most found rescues. 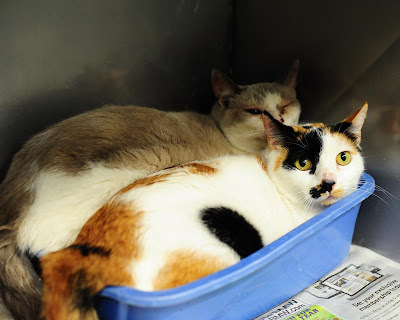 Gorgeous Adele and Aurora before ending up in at the hoarder house. When we first heard about this, we scrambled and all of the local rescue people we work with got together and tried to think of what cats she had from our shelters in Broward and Miami. We came up with nine. We rounded up pictures and I posted them in a Facebook album and shared it with the woman who was getting the cats out. She compared our pictures with the cats she had and we were able to identify seven of them! Those seven are now lined up for an emergency re-rescue transport today out of Tampa and back down to South Florida so we can find them REAL forever homes and get them any vetting and care they might need. I am so sad for them, but I hear our seven are in decent shape. I have not even seen pictures yet. So this afternoon, Aurora, Adele, Pretty, a Calico (who never had a name), Misty, Casper and Panther are catching a ride with some amazing Cuteheads who dropped everything and doing a lot of driving and a lot of last-minute coordinating to get these kitties down here. The precious Calico who we need to name. She was scared before she went, and we are hearing she is still a little scared, many months later. Poor girl. She needs a home! Of the seven, one named Aurora has an eye condition that will need to be treated. She was originally surrendered to Pompano with her sisters Adele and the Calico. 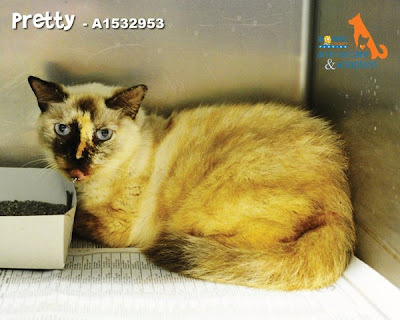 One is a sweet senior Siamese girl named Pretty. Misty is a long-haired tortie. Casper and Panther are on the way back down, too! There were two others, Oliver and Tiger, that we weren't able to track down. I am told there were 24 orange tabbies in the house... and Oliver was one of them. Same for brownish-gray tabbies like Tiger. We couldn't find any with their exact markings. I am hoping they got a rescue. All of the cats there did, pretty much, thanks to a huge effort by so many. And so, our seven cats are coming down here today. They will go to our kitty condo (thanks again to Cutehead Nancy for letting us use her empty condo!) and they will see a vet. When they are healthy, they will all find homes. A couple, Aurora and Adele, are being rescued by HART of Maine, who we have sent kitties to before. We are so grateful for their partnership! Pretty is the luckiest one of all -- she has a wonderful couple waiting to adopt her. All in all, we have no idea what this emergency re-rescue mission will cost. We borrowed five carriers from a vet friend of mine from Alafaya River Animal Hospital in Tampa (click link to "like" them on Facebook please!) and I have to ship them back. All of the cats need to see the vet and probably get all their shots. We have no idea what they had done up there, if anything. They also need food and litter and a couple beds and toys while they are in the condo. And then they need to be transported somewhere. I am so horrified and sad for all of the cats who were in this woman's house, but also so thankful that we are able to help and get these ones down here to us. We'll keep an eye out for Oliver and Tiger and see if they pop up at any of the rescues who also saved cats. I am putting up a donation here if anyone can help out. We are, of course, going to get these kitties all they need, but it does cost money and I typically end up spending a lot myself, as does our fabulous partner in rescue, Good Karma Pet Rescue. I am assuming it will probably cost $50 for each cat, depending on what they need. They will eventually need health certificates as well for transport, which is an additional $15 each at our rescue rate. Any extra will go to saving other kitties! If you can help out in any way, it's much appreciated. If not, cheer us on! I will post updates on these special re-rescue kitties and will be tweeting with the hashtag #SaveHoarderCats on Twitter so everyone can follow along as they get here today and treated and adopted. Humongous thanks to Cuteheads Tristin B. and Pam C. for going out of their way to drive these kitties today. Tristin is picking up cats from all over and driving from Tampa to Fort Myers and Pam is driving from Fort Myers to Plantation, FL to us. Also, huge thanks to my sister, Cutehead Evyan W. for doing a major Cat Carrier Transport this morning so the kitties have carriers to travel is. She is driving all around Tampa, collecting donated carriers so we have seven of them for the cats, and dropping them all off at Tristin's. Thanks to my parents, Maraly and Bob W., for preparing the condo for the kitties' arrival and our friend Byron for agreeing to meet the kitties and settle them in when they arrive. Thanks to our rescue friend, Maribel M. for helping coordinate and track down the kitties as well. Thanks to TAPS Trust Again Pet Shelter for temporarily holding some of these cats while we worked out transport. 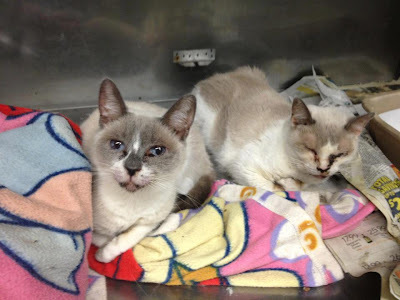 And TREMENDOUS THANKS to our partner in rescue, Stacey of Good Karma Pet Rescue for not even blinking about taking these cats in and making sure they get the love and homes and care they truly deserve. Also - I'm not sure how much she wants her name out, but to the woman who has helped and been on the front lines in this house pulling the cats... There are no words that say enough. What she has seen and all that she has done for these cats is immeasurable. They all owe their lives to her. 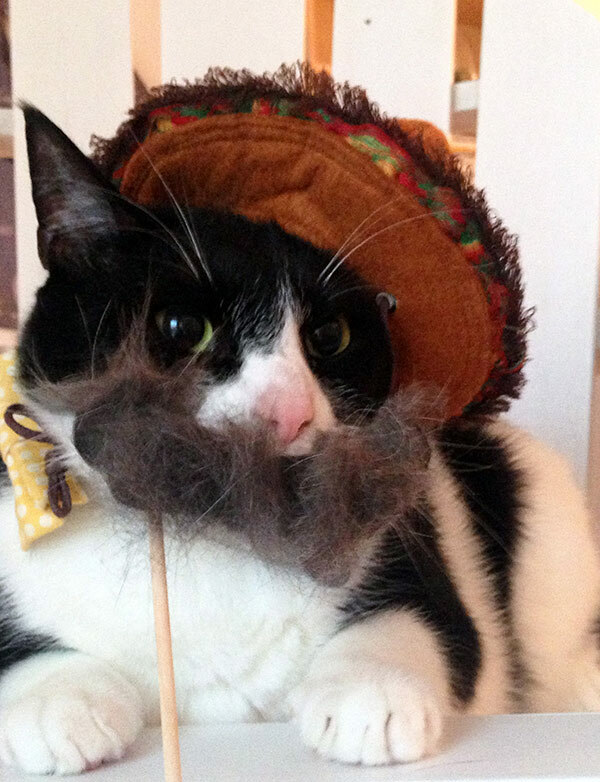 Moo's MOOstache for Hairball Awareness Day - Plus a FURminator Giveaway! A little while ago, I got asked to do something silly. To celebrate and raise awareness for National Hairball Awareness day, I was asked if I would take a picture of my cats with a fur mustache. The crazy folks at FURminator always come up with something silly for this day, so I expected no less. Sure, I said! Pimp and Moo are always up for a silly photo op , so we're in! A week or so later, a cardboard mustache on a stick arrived. My instructions were to use the FURminator (we got a few of those, too!) to brush the kitties, then somehow apply their fur to the mustache, hold it up in front of their face (it was attached to the stick) and take a picture. Easy, right? You try sticking something in front of your cats face and see if they don't smell it, bite it, swat it, move to get away from it, or all of the above. Anyway, after much trying to distract the cats from looking at the mustache and catching them at just the right moment, we ended up with this gem. Yes, he's wearing a sombrero. We happened to have one (of course we had one! ), so I figured it would match the mustache nicely. It's always good to accessorize. Anywhos, this was so silly (a bunch of other bloggers did it, too!) that PEOPLEpets ran a slideshow of all of our pictures even! You want to get extra hair off your cats, too? Cute is here to help! 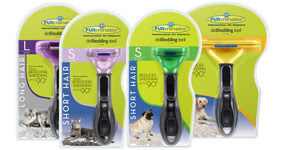 We have one FURminator to give away to one lucky winner! I believe they can only ship to U.S., so sorry to our international Cuteheads. You have to sit this one out. But anyone who wants to win, just leave me a comment saying you want to win (and make sure your email address is tied to your comment account! ), and we'll pick on lucky winner on Monday, April 29. OK? OK! Happy Hairball Awareness Day, everyone! It's very important to stay in shape. If you don't have a gym membership or weights at home, you can just use your cats to add resistance! It's good exercise for your you -- and fun for your kitty! Here is a delightful workout video that shows a whole bunch of moves you can do, and the only equipment you need is a cat or two! BONUS CUTE: You can also run on the treadmill with a cat! I'm not sure if these two silly kittens are playing Jack-in-the-box or Whack-a-Mole with each other, but the one in the container surely has the upper paw here! And she's not giving up her spot. No way, no how. No space in here for two kitties... even if they are tiny! Get your own cylinder, silly! BONUS CUTE: Peek a boo! I have seen cats who like to ride vacuums and those who like to be vacuumed, but have you ever seen one that liked to lick the suction hose when it's running? I have no idea how else to describe it. This is one silly kitty! P.S. Our next transport is coming up soon! If you'd like to be a volunteer driver, please fill out our driver form so we can contact you if a kitty needs to go through your area. The more drivers we have, the more cats we can help!